The article gives a quick overview of a simple statistical multipath channel model called Rayleigh fading channel model. In a multipath environment, it is reasonably intuitive to visualize that an impulse transmitted from transmitter will reach the receiver as a train of impulses. where is the phase of the path. The phase of each path can change by radian when the delay changes by . If is large, relative small motions in the medium can cause change of radians. Since the distance between the devices are much larger than the wavelength of the carrier frequency, it is reasonable to assume that the phase is uniformly distributed between 0 and radians and the phases of each path are independent (Sec 2.4.2 [WIRELESS-COMMUNICATION: TSE, VISWANATH] ). When there are large number of paths, applying Central Limit Theorem, each path can be modelled as circularly symmetric complex Gaussian random variable with time as the variable. This model is called Rayleigh fading channel model. is called a Rayleigh random variable. This model, called Rayleigh fading channel model, is reasonable for an environment where there are large number of reflectors. sir, can u please explain what is V-BLAST in your words. @jagadeeswara reddy: Well, that’s a difficult ask. Hope the following pointers will be of help. i just want to ask that is there any relation between AWGN noise variance and offset in Wireless signals like OFDM. @Aman: The noise, caused by the random motion of electrons, is characteristic of the device and is independent of the modulation. Can you explain me about the STBC frequency selective fading channel. Please Sir Send me the matlab codes for STBC for multitap channel. I need the codes very urgently. @jyoti: When STBC is coupled with OFDM, then the multipath channel becomes independent flat fading channel for each subacarrier. Thanks , Can I have the matlab code? @Guman: Frequency response can be found using a fft() or equivalent tool to capture the frequency domain information. From the frequency response, one can look at the profile define the coherence bandwidth. @Krishna: Thank you very much for your informative articles. I have few questions slightly related to this article. I need your opinion on how you would have approached this scenario. This scenario is hypothetical. Assume I have to design a communication system for a specific area and specific purpose. My customer specified me minimum BER (QoS) and transmit power. I have liberty to choose rest (for eg: delay, modulation, complexity). Now I have to choose modulation technique, error correction algorithm. This depends on, what channel and bandwidth is. Assume I am able to measure channel. Find PDF of the channel somehow. Using this PDF, I can find outage probability or Bit error rate. Step 2: To meet this BER, choose modulation technique and error correction algorithm. Step3: Decide how much Sync you need, based on Channel. Step 4: Start design and test back. My question is Q1: How to measure real time channel if I don’t have built communication system? Q2. Is my approach is right? Q3. If I am right, have I overlooked something. I am waiting for your inputs. Nice. One would also need to look at the range requirement of the communication link. To start off, assuming a free-space path loss model, transmit power and receiver noise bandwidth one can get a good estimate for the range. Now depending on whether the system is going to be indoor or outdoor, the free-space path loss model needs to be tweaked. Doing a channel measurement in the target deployment environment is definitely a good idea, however it may be expensive and time consuming. Alternately, one can look at typical channel models available in the literature and pick one which can closely match your desired use case. Hope this helps. How can we relate SNR with (or in terms) path loss model? @Thoyagi: That should be straight forward. hi mr. krishna, I need your help please in CDMA multipath Rayleigh fading by MATLAB . @musaab: sorry, i have not posted anything on CDMA till date in the blog. Simulation is not yet a rayleigh model. I believe it is the constant h that the data are already convoluidos that is fixed by h.
randn should be generated for real and imaginary Simulation adequate? @Paulo: Depends on what is your expectation from the simulations. isn’t it supposed be divided by 10? i am trying to use ”rayleighchan” inbuilt function in matlab 7.11,but it gives me following error… Undefined function or method ‘channel.rayleigh’ for input arguments of type ‘double’. actually i want to construct one doppler object….for that i need this rayleighchan function…..can u plz help me out….. I need MATLAB programs to determine the error probabilities for orthogonal signalling by employing Hard decision and Soft decision decoding. The aim of the project is to investigate the performance of BPSK and (QPSK) modulation schemes in Rayleigh fading channels using Monte Carlo simulations. where x is the transmitted signal, α is the channel coefficient (Rayleigh distributed), and w is the zero-mean additive white Gaussian noise (AWGN). Generate a large vector of the random input signal x (assuming uniform distribution) using bipolar representation of 0’s and 1’s. Generate a large vector of the channel coefficient α realizations. Show the match between the obtained distribution and the theoretical one (as given in 5.49 in the text book). Generate a large vector of the AWGN noise realizations for different values of the noise variance (σ_n^2). Show the match between the obtained distribution and the theoretical Gaussian distribution. Implement, in MATLAB, to obtain the received signal y (using as sample from the generated vectors above for each iteration). The channel power has to be unity. Implement the detector as a simple threshold detector and the compute the average bit error rate (BER). Remember to accumulate at least 50-60 errors for each BER value. Plot the resulting BER versus the signal to noise ratio (SNR) in dB. The range of SNR should be from 0 to 30 dB. Compare the obtained curve to the one in fig. 6. 53 in the textbook (or use eq. 6.156). Hiii, I want to tell immense thanks to owner of this dsplog for such a good nd helpful hand towards sharing knowledge. I personally felt to show my feelings here that my field is Communication and doing MS in the same field, as while doing my work I get some problem and when no any book can help in finding the solution certainly my mind clicks me abt this blog to get the solution and actually I get it every time even in the simplest nd fully understandable way. Thanks for such a nice contribution. Sir, i have a doubt in 802.22 basics. It tells, due to switch over from analog tv tx to digital tv tx , lot of white spaces are available. WRAN devices sense this white space and use it. Plz…plz..reply…i am not sleeping for the couple of days…i could not find the answer in google and books…plz help me.. and reply as early as possible…. Do you have any topic related to Rician Fading Channel? I am doing assignment and want to know more about analytical equation for Rician. Tks. your suggested article and Coding related to PDF of rayleigh fading channel helped me very much …… Thank u again sir……..
Sir, one problem is there with me is that i want to generate wavelets of signal at tx side in order to send via multipath rayleigh channel…. Sir plzzzzz help me… give me some way to generate wavelets on this tx signal.. Thanks for the explanation. Shouldn’t the Rayleigh pdf be [z/sigma^2]*exp[-z^2/(2*sigma^2)] ? You have written it as sigma^3 for the first term. @Sandeep: Thanks for noticing the typo. I corrected it. U r doing good work. Keep it up. @Pushpa: With high doppler, the channel will be time varying. I have not tried modeling that case, hence unable to provide you a simulation code…. Please i which to ask that how can i model a two ray equal power channel model with delay spread between adjacent paths. I am considering delay spread of 5 and 40 microseconds between adjacent paths. Please if you have any code on this i will appreciate your help . @Ilesanmi: For a two ray channel, create channel with two taps with same amplitude. Insert appropriate number of zeros between the taps as per your sampling time definition. I would very thankful if you could also help me with my question like you have helped so many people here. I am trying to implement a SRRC pulse shaping for QPSK modulated scheme in MATLAB. Filter length = 21 taps long. Filter type: Single tapped delay line filter. Thank you very much for your prompt response and links to the relevant discussions. Previously, I have simulated the Raised Cosine pulse shapes and received them using the matched filter receiver. I have also plotted the raised cosine pulses and verified it with the eye diagram. I am getting stuck while implementing SRRC pulse. There was a post by someone in one of the discussions seeking help for the error in code but it wasn’t answered in great detail. It would be great if you could help. This is really important. @Nikita: If you are able to get the raised cosine thing up, then getting root raised cosine simulation might be reasonably simple. You are doing an excellent work. Are u conducting a course or course material on matlab. I am trying to related the number of Tap of Rayleigh fading with its RMS delay spread. I found this code somewhere online and does this help? For OFDM the symbol duration, TS = 4us and im looking at tau(rms delay spread) = 75ns. In the end, i only get 2 Taps. Is this correct? If the channel became Nakagami-m multipath fading channel,How to present this type of channel. when i am doing the simulation of the rayleigh channel.I choose the formula r(t)=sum[ an(t)*x(t-tau(t))]. My question is how can i generate the attenuation an(t)? Could you kindly send me some code where there are multiple users and each is assigned a signature waveform(DS-CDMA). I need this is study the BER of such system. can u tell me how to do channel estimation for OFDM System with pilot symbol intoduced . The pilots are introduced in block type. The channel estimation has to be done by LS method. In your post you said theta(n)=2*pi*fc*Tao(n) is the phase of the nth path; what does it mean? is it the phase delay introduced by nth path? If so then how can we say that? I mean we know the overall delay introduced by all paths is basically the phase response but how can we say it to individual path? I wanted to know regarding how can i model a GMSK modulation over two path rayleigh channel, in matlab using rayleighchan command, and also reg BER calculation & plot.I am new to matlab and i am unable to demodulate my signal after passing it through rayleigh channel. Hello Krishna Pillai I am student doing my thesis I have one problem it looks like you have discuss about it. but I am not clear . the problem is about computing SNR value base on distance using Erceg model for pathloss can it be SNR=Pt+Gt+Gr-PL-Rs where Pt is transmitted power, Gt is the antenna gain Gr is the receiving antenna gain PL is the pathloss and Rs is the receiver sensitivity (which comprises of themal noise, noise figure etc) ? @Dahiru: Yes, the equation is correct. @waleed salos: Sorry, I have not discussed LMS beamforming. thank you for sharing your knowledge. I have one question. How about in case of using Nakagami environment for QPSK modulation . how to implement simulation ? @gulmira: Sorry, I have not tried modeling Nakagami channel. i need to ask that how can i pass my signal through a rayleigh channel, i am comparing the ofdm QAM signal performance by passing it through awgn, rayleigh and racian channel. can you help me with that. i have an ofdm i simple pass it through awgn channel and analyzed it by its command in matlab. now i need to pass that signal with the rayleigh and racian channel as well to visualize. plz help me with that. filtmsg = filter(chcoeffs,1,msg); % Introduce channel distortion. chanest = chcoeffs; % Assume the channel is known exactly. @Mak_m: Is it working with OFDM, but without channel? Further, I do not see the code, for taking the fft at the receiver. I can’t understand the sentence: relative small motions in the medium can cause change of 2 pi radians. Since the distance between the devices are much larger than the wavelength of the carrier frequency, it is reasonable to assume that the phase is uniformly distributed between 0 and radians and the phases of each path are independent……..
@kalidoss: I was trying to mention that phase of Rayleigh faidng channel can vary anywhere from 0 to 2pi radians uniformly. But the performance for this diversity channel comes to be worse than one without diversity, I hope you shed some light on this, or advise an algorithm in line with your Simulations with flat fading channels. @Adnan: I have not tried modeling sphere decoding, but I would guess one would want to get the performance close to Maximum likelihood. Are you observing 0% BER with no-noise case? That BER in AWGN is really nice! i really like it. Do you have Matlab script for computing Bit Error Rate with Binary FSK in Rayleigh channel? I need to write the code for my project. Can you make to send me? @hugh: Sorry, I do not have code for Binary FSK in Rayleigh channel. However, you may look up the post on BER for binary FSK in AWGN channel as a reference. you are good at the channel to BER. Can I ask if add two AWGN channels togeter in the FSK? it is significate to analysis the signal performance. if so, what results will come out? Maybe the comment is a little bit off-topic but I’m quite desperate. I’m writing a thesis to provide with some MIMO capabilities the network simulator OpenWNS. I program a non-gemoetrical matrix channel generator (also knowed as H). To generate this matrix we only need two parameters, number on antenas (Tx and Rx) and correlation factor. Several papers talk about that the MIMO gain deppends on the correlation factor of the channel matrix. The generator works quite good giving matrix with correlations between 0 and 0.6. This formula provide us K post-processing SINR. But when I calculate the gain with the different correalations is always more or less the same, and I don’t know where is the fail/problem. Sorry if it’s disturbs you, but I don’t know what else can I do. After several analisis the problem should be in the channel matrix generator. I obtain the Rayleigh distribution from the gaussian one, making the real part absolute and then accopling the imaginary part. Yes, that is the point. I don’t know what is missing in the channel matrix deffinition. I will try to change the code to work with 2 antennas at the receiver and transmissor side (matrices of 2×2). Any suggestion for the correlated channel generation? @Charly: Sorry, I have not tried modeling correlated channel. Good luck in your explorations. Than you anyway for your attention. plz include flat fading modeling and Fading Effects due to Doppler Spread…and other statistical models as clarke’s Model etc and techniques to combat this. but tell me do we have to u phase lock loop or any other phase detection loop in case of complex rayleigh channel or an lms equalizer would server the purpose???? Hope you are doing well. Can you please mail me the link for performance analysis of MIMO in Rician Fading channel. Thanks. all these statements presented above is extreamly helpful to me, and i resently am trying to simulate a paper in which it needs to entry the circularly symmetric gaussian r.v.,could u help me to code the program? @ lee_john: A circulary symmetric gaussian random variable has real and imaginary components having independent Gaussian distributions. can u plz tell me how the behaviour of real single tap rayleigh chaneel differs from complex single tap raleigh channel.??? @sara: In the case of a real channel, only the amplitude is affected. With a complex channel, both amplitude and phase are affected, agree? chào ngài,tôi đang làm mô phỏng OFDM,điều chế QAM trong multipath(rayliegh), làm thế để tái tạo lại được chòm sao QAM? @jenifer: Can you please translate your query to english. @sara: Sorry, due to time constraints, may I decline to debug the code. Further, I do not have most of the functions which you have used here (i use Octave for my simulations – do not have matlab). Adaptive Equalizer Simulation (Part I) This script simulates a communication link with PSK modulation, raised-cosine pulse shaping, multipath fading, and adaptive equalization. hope you must be fine…..
@sara: How are you equalizing for the effect of the channel. In general, if you are introducing a channel h(t) in the received signal, at the receiver you should introduce a filter g(t) in the receiver such that g(t) convolved h(t) is an impulse. Well I am doing a project on ultra wideband system.I have done my simulation for AWGN channel.Now,I want to add rayleig channel to my transmiited data.Can you plz tell me the matlab code for generating rayleigh fading. hi Krishna,I get a hard time in implement the MMSE linear equalizer (non-adaptive) can you help me please..thanks. @jawad: Please refer to the post on MIMO with MMSE equalizer. @nataraj: I have not worked much on channel modeling. Most of my simulation were assuming flat fading Rayleigh channel. However, yes we can discuss. I want to simulate measures in the time in a static receiver and I need to know how us the “raylrnd function” in MATLAB. I don’t understand The Help in MATLAB because I get big numbers. Also I think the “lognrnd function” is more easy to use so it is correct to use the “lognrnd function” instead of the “raylrnd function” in MATLAB?. h = 1/sqrt(2)*(randn(1,N) + j*randn(1,N)). @akram: Sorry, I have not worked on blind channel estimation. Sorry, I forget to put some code. Where n_r/n_t is the number of receive/transmit antennas (to generate the matrix) and b is the sigma of the rayleigh distribution. R= raylrnd(B,m,n) returns a matrix of random numbers chosen from the Rayleigh distribution with parameter B, where scalars m and n are the row and column dimensions of R.
I don’t know what B parameter I need to put. I’m making some simulations in Matlab (trying to obtain a MIMO SNR stimation from a SISO SNR, without any geometrical information). I make the assumption than we where indoor and the channel can be modeled like a Rayleigh distribution. After check several codes all the people is making a channel Matrix (H) with the rand function, what about the raylrnd function? I’m trying with this function but I don’t know what sigma I need to use. You can help in find this value? (or any idea to get 4 diferent SNR streams (4×4 MIMO) from one SNR stream (SISO). @Charly: In the simulations, which I did, I defined a flat fading Rayleigh channel comprised Gaussian distributed real and imaginary components. h = 1/sqrt(2)*(randn(1,N) + j*randn(1,N)). The 1/sqrt(2) factor helps to make the variance of h as unity. You are designing a time-variant..
How can you convolute if you are using time invariant channel..
@Thiruppathi: Infact you do need to do convolution for each ofdm symbol. You can take the full vector (which is the concatenation of several ofdm symbol) and convolve that with channel ht. 1. Am not familiar with modeling doppler. Hence not commenting. 3. conv(ofdm_signal, channel) is correct. thank you sir, i have one more doubt. @thiruppathi: Well, I think, to model time varying channel you might need to do multiple convolution on the packets. For eg, the first chunk of time you do convolutional with a channel, the for the next chunk of time, you convolute with another channel. @thiruppathi: I have not written posts on modeling doppler effects. Maybe I should do. Will do so in future. I need some ideas about How to calculate Avrerage SNR per symbol for plotting SER Vs Average SNR in dB? Can you help me? @Benzia: Average SNR per symbol can be set by measuring the power of signal and noise over large number of symbols. 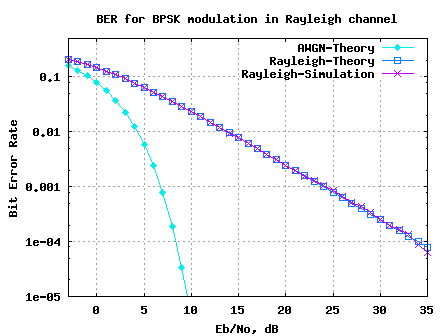 I have written a post on BER for BPSK in Rayleigh channel with OFDM modulation. The signal and noise scaling in the Matlab model accompanying the post should be helpful. I doing project in channel estimation using block and comb type pilot pattern(ofdm_system). @Thiruppathi: I have not tried doppler, but I can provide you a pointer to Rayleigh fading. In that post, I convolve OFDM transmission with a 10tap rayliegh channel and equalize for the channel and compute BER. I assume that the channel is known at the receiver. In your case, you made do channel estimation and use the estimated channel for equalization. hai,i am doing a blind channel estimation scheme for OFDM,can u suggest a good way and please suggest how to model the channel.Do we have to model using the impulse response form,and what is channel length? @akram: Sorry, I have not worked on the problem of blind channel estimation. The multipath channel is typically modelled in the time domain – using impulse response. The shape of the impulse response and the duration of the impulse response depends on the environment under consideration. Hello Krishna,i am not sure of channel length mentioned some in research papers,can you enlighten me on this aspect,and by ensuring length of c.p < channel length, ISI is avoided in OFDM,Is that so? @akram: Yes, you are right. 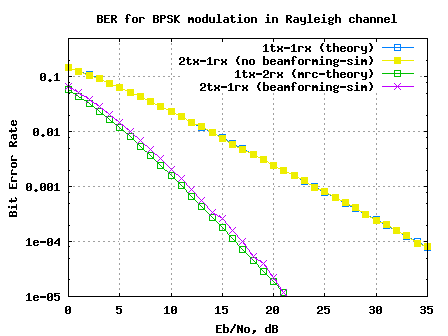 You may also look at the post BER for BPSK with OFDM in Rayleigh multipath channel. 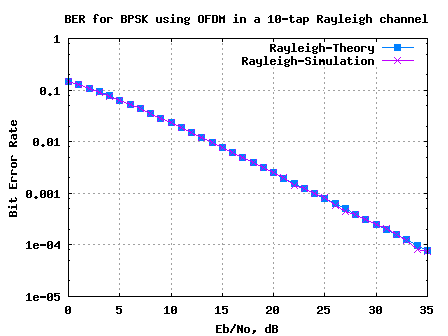 In that post, the channel is a 10-tap rayleigh channel and the OFDM system has a cyclic prefix durtion of 16. As there is no-interference, the BER performance is comparable to a flat fading Rayleigh channel simulations. @nebal: Sorry, I have not written posts on PCM systems. @Richard: Can you please translate the query. Currently I do my thesis and will submit next week but until I still cannot plot rayleigh pdf apply to my model. My data measurement by array 121(11×11)points so how to plot? I no have much skill for matlab so if you can guide me some or if possible write complete code to me that is good for me I dont know anyone more to help. @mak: I did not understand your problem statement. Can you please elaborate more. I need ur help in simulating MC-CDMA. i create the channel as i early told u in this way. when I used one Tap i can use zeroforcing method as u described. Then how i make equalization at receiver. I am trying to simulate IEEE 802.22 WRAN environment for my MSc project. Network consists of a WRAN BS with 50 CPEs spread randomly within its coverage area and a TV broadcast station located further away from the WRAN environment. My aim is to get the SNR of each of the 50 CPEs due to the signal (BPSK signal) from TV station. Channel is assumed to follow Rayleigh fading distribution. How to i do this preferably in MATLAB? @Bwalya: From your problem statement, it seems like you are looking for finding the path loss from BS to each of the 50 CPE’s. For doing that, you need to know the path loss exponent in the environement. Based on the transmit power and the path loss exponent, one can find the received power. Once the received power is known, based on the noise floor of each receiver (ideally depending on noise bandwidth), SNR can be computed. Thanks but i still have some concerns. My path loss exponent is say 3.8 but as the 50 CPEs are randomly distributed i cannot predict their distances from TV station, which are needed to get the received power for each CPE. How do i get around this? I prefer to use MATLAB. @Bwalya: Maybe can you use rand() function to generate uniformly distributed random variables which is in a circle to generate the distance randomly. Small Matlab/Octave code snippet along with. The absolute value of op maybe used as representative of distance. Thanks Krishna, your hint seems to have just opened my eyes. I’ll keep informed of the outcome. A time-invariant indoor wireless channel with LOS component at delay 23 ns, a multipath component at delay 48 ns, and another multipath component at delay 67 ns. LOS component == first multipath component ? @Ramya: In the case where demodulator synchronizes to the first multipath component, it means that we have significant energy from the pre-cursor (los component). I think, you need not treat LOS component == first multipath component. Treat it as a channel having both pre-cursor taps and post-cursor taps. @Thiruppathi: For modeling channel model with exponential power delay profile, one may look at the Naftali channel model used in 802.11 communications. The article Modeling Multpath in 802.11 Systems should provide you more insights. thank you so much –it is helpful my work. I am not sure how to obtain sigma^2, so in the matlab code, i set 2sigma^2 = 1. @jimmy: I do not think it is possible to find the random variable from the probability of the random variable. For eg, consider a simple uniform distributed random variable from 0 to 1. Its CDF is linear between 0 and 1, but it does not mean that we can find the random variable. I was talking about BPSK BER simulation in AWGN channel. I didnt mention it in my previous mesg. I have seen the Script for simulating binary phase shift keyed transmission and reception and compare the simulated and theoretical bit error probability. In that Matlab code i had small doubt.I the noise addition y = s + 10^(-Eb_N0_dB(ii)/20)*n; Why are U introducing 20 instead of 10 for converting Eb_No_db in db to ratioless quantity. (as power is dealt). @ramya: The term Eb_N0_dB corresponds to the bit power over noise power. However when we are adding noise, we are adding the noise in the voltage domain (and not in the power domain). Hence to scale the noise voltage, we need to use 10^(-Eb_N0_dB(ii)/20). Hope this makes sense. i am working on ber calculation of ofdm channel through nakagami fading channel ..
do u have some matlab code for that..
or how to generate nakagami fading channel? @Abrar: That should be reasonably simple. The zero padding is done to ensure that the matrix dimensions are matching. Does this help? can u tell me how I generate X2 and X3. how I put delay in signal. Sure, do send in your results. The second section of the post discuss SER for M-QAM in Rayleigh fading. Hope this helps. Once I understand the equations, I may write an article on the topic. Have you managed to determine the BER performanve of M-QAM modulation over a rayleigh fading channel? I understand the process of getting the BER for BPSK over the rayleigh channel, but get a bit lost when it comes to 4/8/16QAM. In particular I would like to know how to generate the coefficients and apply them to the signal. @Lealem: Sorry for the delayed response. I have seen the simulation code which u used to simulate a Rayleigh fading channel. But i would like u to ask a hit how to simulate a frequency selective Rayleigh fading channel for OFDM application. I think the above simulation out put is a flat Rayleigh fading. @Lealem: Sure, please do post your question. Hello! Krishna how are you today? i just need a hint to simulate an OFDM over a time varing multipath fading fading channel(rayleigh), i have begin doing a simulation but i encounter a problem in the midle of my work. Can u please help me! @Lealem: This something which I am planning to do. Like we derived the BER for BPSK in AWGN channel, we will derive the BER for BPSK in Rayleigh fading channel and back it up with Matlab simulation scripts. This is something which I am planning to do with in the coming 7 days. can you please help me how to plot the channel impulse response. I mean for varying delay how can we plot the power delay profile for channel impulse response in matlab? If we assume that the sampling frequency of the taps is Ts, then the first and second tap are separated by 3Ts and the second and third tap are separated by 4Ts. …..or Over an OFDM system.performanve of M-QAM modulation over a rayleigh fading channel(i.e SNR Vs BER). need your help krishna please.